So, I finished Robert Manry's Tinkerbelle last night, and now I'm thinking that entering the Blue Moon in the Jester Challenge would be quite reasonable. At least in comparison to Manry's trip! Like the contemporary small boat voyager, Roger Taylor--who has sailed his little Mingming and Mingming II in the Jester Challenge, as well as on many high latitude voyages up into the Arctic--Manry was no risk taker, no adrenaline junky. Quite the opposite, in fact. By thinking deeply about the problems and addressing each in turn, he systematically minimized the risks of his voyage. That got me thinking: what changes could I make to the Blue Moon to minimize the risks of sailing (twice!) across a mighty ocean? This is the big one, right? Once you minimize the risk of sinking after, say, hitting a container or whale or growler, it becomes a lot easier to think of such a voyage. Of course, it's not possible to completely eliminate the risk, but with watertight crash bulkheads, pumps, and enough kit to repair most holes, it should be possible to rescue the boat from all but catastrophic damage. Probably. The risk of getting run down by a large ship is undeniable. There are many stories of near-misses, especially from single handers. Actual strikes are harder to catalog, presumably because the boats simply disappear. The laws of the sea require all boats to keep a good watch, but this is impossible for a single hander to do on his own. But as technology has provided automated steersmen (autopilots), and navigators (GPS), it has also provided automated watch-standers in the guise of AIS and radar-based collision alarms. There's not much use having an unsinkable boat if you don't stay on it. It's interesting that Manry and Taylor take completely different approaches. Since Tinkerbelle couldn't steer herself, Manry didn't have to worry about his boat sailing away from him. He simply tied the end of a sheet around his waist when he was on deck. When he fell or was pitched overboard (which happened frequently! ), Tinkerbelle rounded up, and he simply climbed back on board. Easy peasy. Taylor minimizes the risk by hardly ever leaving the cabin. He's rigged Mingming so he can steer, adjust sails, and keep watch from the comfort of his warm, dry shelter. Weather routing can help avoid heavy weather, but a boat that crosses the Atlantic twice will have to deal with at least some bad weather. Both Manry and Taylor make use of sea anchors, but very different sorts! Manry made do with a canvas bucket tied to a long rope, deployed over the bow. 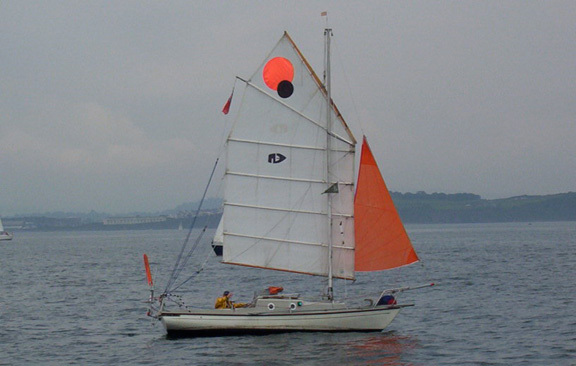 By unshipping the rudder and deploying a small riding sail, Tinkerbelle would point straight into the wind when lying to her 'sea anchor'. Most boats won't. 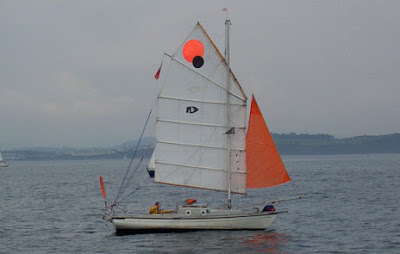 Taylor takes a more modern approach by carrying a Jordan series drogue, and deploying it over the stern. He has ridden out truly terrible Arctic storms with this rig. See 8, below. The risk of fire on the Blue Moon is already pretty low: I use an unpressurized alcohol stove, which is about the safest stove available, have no inboard engine, and use LED electric lights which don't even get hot. The main risk comes from the battery or a short-circuit. Again, the Blue Moon starts off better than most boats her size. Her rig is simple and easy to repair. She has virtually no built-in 'systems' that can fail. And her captain is pretty handy. Minimizing this risk should just be a matter of bringing spares, basic materials, and tools. Another way to minimize risk is to minimize the number of days at sea. The fewer days your are 'out there', the lower the risk. Route planning and keeping the boat moving are key. I include this risk in my list because I plan to do some sailing around the UK and France while I'm over there, and it would be ironic to lose the boat before the Jester Challenge begins because of an anchor dragging. I hate irony. It's highly unlikely that we'll hit a submerged container, fall overboard, or catch fire. It's a sure thing the crew will get tired, make mistakes, or breakdown. The keys to minimizing this risk are the same as onshore: enough sleep, enough nutrition, enough exercise, enough mental stimulation. On a gaffer, the biggest risk is chafe, having the right amount of sail up, and using preventers. I have lots of ideas about how to optimize the use of the rig, while minimizing the risk. Will probably need both bigger and smaller sails that I currently have, and make it easier to make sail adjustments. Imagine your boat gets knocked down in a storm and enough water comes in the boat to knock out your batteries and engine. You now have no electricity. Can you navigate? Pump water from your tanks? Show running lights at night? Cast a cheery glow down below to keep your crew's spirits up? Deploy and/or retrieve your anchor? Paradoxically, I'm more interested in maximizing the risk of getting lost. Not really, of course, but GPS does take a bit of the fun out of voyaging. Thus my interest in celestial navigation. I'll also bring several GPSs, of course! I'm not stupid. It's tempting to imagine that by foresight, planning, and hard work you could eliminate all the risk of a transatlantic voyage, but that would be tweaking King Neptune's nose. Therefore, one must humbly accept the fact that the worst could happen, and be prepared to abandon ship. I like Lin and Larry Pardy's approach of taking an active role in self-rescuing themselves with an unsinkable and sailable dinghy, rather than passively surrendering with the liferaft/EPIRB approach. The fact that they got this solution working on a boat not much bigger than the Blue Moon makes me hopeful I can make it work, too. We'll have to see about this one. So, that's my first cut at a to-do list. What do you think? There's not much original about it, but it's the first time I've thought about these things, so it's new for me. I'll need to give each a lot more thought, but before I do, is there anything I've missed? Write your ideas and comments in the comments section below, please. Another milestone passed: I've finished proof reading An Unlikely Voyage and sent it off to the publisher. With any luck, it should be available in a few weeks. I am really excited. That's the good news. The bad news is, it's snowing. Again. I need to go shovel the drive way. Grrr. John, I always look forward to your post and read them with relish. I wish you well on your future plans. Thanks! This one is wackier than most. But interesting, right? They have some very good advice, especially on gear choice and thought processes. That looks good. Found something useful on the first page I read. Thanks! How can you ever encounter exactly 10 risks... The risk is the lack of creativity in risk identification, isn't it? I'm sure there are loads more, Erwin, but you have to start somewhere. Any ideas? The main risk which is both physical and psychological is the worry of sinking. Robert Taylor in all his Ming Mings fits watertight bulkheads and stuffs the stern and bow areas with closed cell foam thus pretty much making his boats unsinkable - I think this is a great idea. I totally agree, though foam isn't a good option for wooden boats. How will she self-steer? Sheet-to-tiller at an absolute minimum, I'm guessing, up to nifty diy or store-bought (pricey) wind vane rigs. You can't keep your captain & crew sane and well-rested if hand-steering! I'd file question this under "Minimize the risk of crew breakdown". On my 2000 mile voyage from the west coast of Florida to New York, I used both sheet to tiller steering (when off-shore) and a tillerpilot to self-steer her. Here's a post about my experiments with her sheet-to-tiller system. I thoroughly enjoyed reading about your 2000 mile voyage and look forwards to hearing about your tales from the 'Jester Challenge'. Look after the crew and the risks remain manageable. Let us know if you sail the Blue Moon into the Solent when over in the UK. Read Lin Pardey's Storm Tactics Handbook and you'll see why running off before a storm can be a fatal mistake and Jordan series drogues are often impossible to recover and often have to be cut loose because of sea conditions. I haven't read that book for awhile, but will definitely check it out again. Thanks for the suggestion. I found this post a very good starting point, so interesting that even I have translated it into spanish to privately share it with my group of friends. We are a group of eight sailors in the forties to sixties, in south Spain in the bay of Cadiz. I have been always looking into this kind of analysis about risks and you provide a well organized way to start. I do not find a word in your post about ship's collision risk, and in my opinion it is among the important ones, so important that there are both international regulations and technical solutions to minimize it. Should you need anytime the free translations of your post into spanish, please let me know and I will forward them to you as they really belong to you not to me. Dang! You are right. It's in my outline. I even had a name for it: 'Minimize the risk of getting run over'. How the heck did I forget that one? Thanks for letting me know. I will fix. Did you overlook the biggest risk? How do you help Helena not be constantly worried? I think sailing down the coast of Brazil with Eric Forsyth permanently recalibrate Helena's worry meter. i am an old atlantic rower. i was interested in your comments about making a boat 'unsinkable' as roger taylor thinks he has done. in the world of ocean rowing a boat is not self-righting or unsinkable until you have tested it by turning it over with a crane and swamping it. i doubt very much that rogers boats are unsinkable...at least i wouldn't like to bet my life on it. geoff allum.